Being a talented psychic and Tarot reader would be enough for some, but Rubbizfire didn't want to stop there. She's studied Wicca and is now a white witch, Ordained Minister and a paranormal investigator who shares her findings on her new radio show No Ordinary Psychic on the BTR Network. 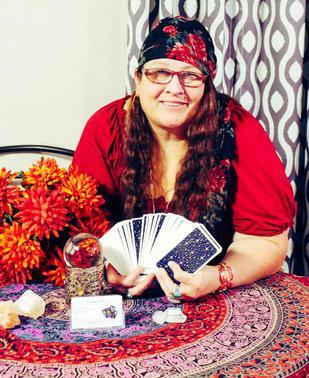 21 years ago Rubbizfire discovered she was a Tarot reader when her friend was playing with a new Tarot deck. 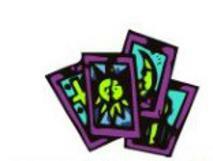 Her friend read straight from the book, not understanding the meaning of the cards, but when Rubbizfire looked at the cards she saw pictures and swirling imagery that told a story of the past, present and future. She was so great in fact her friend gave her the cards and told her to start using them. That was her introduction into the occult. The biggest obstacle Rubbizfire felt she has had to overcome is her Catholic up bringing. When asked about those who have not supported her she says, “ She is thankful for those who have always supported her, her husband of Twenty four years, her son, mom and aunts and some very close supportive friends. Rubbizfire doesn't allow any negative energy from others to hold her back from using her gifts to help others achieve their inner peace and spiritual freedom from negative energy from others. Contrary to popular belief that psychics are mystical and or weird, Rubbizfire proves she is just like everyone else. She believes the most normal thing about her is that she loves being a wife and a mother first and foremost. On her off time she enjoys baking, playing card games, photography, readings and researching the paranormal. Since ghost don't scare her, what exactly does scare a psychic of her caliber? “Snakes and spiders! Especially the ones with poisonous bites. In the future Rubbizfire is looking forward to expanding her business even further to begin doing metaphysical conferences throughout the United States and to meet more of her clients in person across the country. Right now people know her by her voices when she gives her clients shivers through the telephone lines giving them details only a true psychic would know.